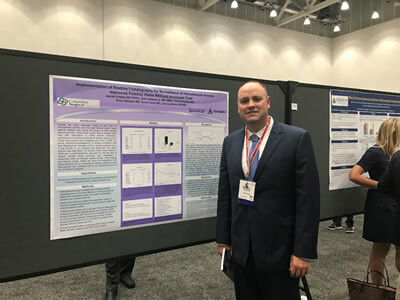 Congratulations to our CSA Vascular Surgery team for being awarded a poster presentation at the Annual Meeting of The Society of Vascular Surgery! The poster presentation included a summary of years of data developed to demonstrate the benefits of our preventive maintenance program for the pro-active management of dialysis access. The formal name of the study presented is "Implementation of Routine Fistulography for Surveillance of Hemodialysis Access: Improved Patency Rates Without Increased Cost." You may know the Vascular Surgeons at Columbia Surgical Associates (CSA) encourage regular fistulograms, a simple dye procedure that can detect and correct issues with an AV fistula before they become a major problem. What you might not know is that our program is leading the way to a better future! Hemodialysis is one of only 2 options, short of a kidney transplant, that exists for folks whose kidneys no longer function well enough to cleanse the body of toxins on their own. For people who require hemodialysis, the "AV Fistula" is their lifeline. When we create an AV fistula, we are connecting an artery (carries blood from the heart) to a vein (carries blood back to the heart.) This exposes that vein to the power and pressure that only an artery was built to undergo as blood is pushed out of the heart. We make this connection on purpose so the vein gets large enough and tough enough to be used to remove and return blood to the body after it is cleansed through a special machine. What is A Clotted Access? Nature didn't build veins to do this job, so they can develop scar tissue inside the vein over time. Some fistulas work for years with very few problems, but some fistulas develop so much scar tissue that it can actually close the vein off completely. We call this a "clotted access." When an access clots off it can't be used, requiring urgent surgery to repair the lifeline or to replace it with a temporary option. At the very least a clotted access is an exhausting ordeal for the patient, but it can also trigger some very serious health related issues. Prior to 2009, the plan or standard for managing at AV Fistula was to basically create it and hope for the best. This was a widely accepted re-active approach to a known dilemma. The Vascular Surgeons at CSA became determined to develop a better way for their patients. They wondered if developing a program geared toward preventive maintenance could improve the lives of their dialysis access patients. Just like a regular oil change and a tire rotation every several thousand miles for your car helps to keep it in top working condition; could this approach minimize "access down time," extend the life span of an AV fistula, and could it be done in a way that didn't drive up cost over time? The plan started coming together...Preventive maintenance would become a priority. They would hire a dedicated coordinator who would work with the teams at surrounding dialysis clinics. When signs of new potential problems were detected at dialysis, the coordinator would work to get patients in for a simple dye procedure and correction before it became a crisis. A dedicated vascular surgeon would be available to perform dye tests throughout the week. All AV Fistula patients would be seen regularly. It has been about 10 years since CSA adopted this preventive maintenance approach. That's long enough to create and analyze A LOT of data and it's long enough to submit that data in the form of a comprehensive abstract study to the Society for Vascular Surgery. Can a preventive maintenance program accomplish everything our pioneering Vascular Surgeons thought it could? YES! Congratulations to the Vascular Surgery Team on your accomplishment and thank you for always looking for a better way for the people in the communities we serve! We are so fortunate to partner with you in caring for our hemodialysis patients! To find out more about AV Fistula Preventive services offered at CSA Surgical Center in Columbia, Missouri please call our Dialysis Coordinator Karen at 573-777-3303 and schedule an appointment.